The Coalition for Transportation Productivity, a group of shippers and industry associations that is working to see federal and state laws changed to increase the weight limit on trucks travelling on US interstate highways and other roads, lashed out this week at what is says were false and misleading claims by groups opposing the change. The idea that increasing the weight each truck can carry will result in more trucks on the road "simply defies logic," Runyan says. "These groups are mangling the facts and we're setting the record straight," executive director John Runyan told SCDigest this week, explaining that the Coalition itself just sent a letter to Congress that lays out its case in very direct language. The Coalition for Transportation Productivity was formed in 2008 with some 30 shipper members, whose numbers have grown now to some 185 participants, including both dozens of shippers and a variety of other organizations, such as the American Trucking Associations, the National Association of Manufacturers, and many others. The goal is to pass the Safe and Efficient Transportation Act (SETA) act, which would extend the current federal gross vehicle weight limit on interstate highways from 80,000 pounds to 97,000 pounds, in conjunction with adding a sixth axle to the rear of 53-foot trailers. The bill is being fought by two main opposition blocks. First is the Coalition Against Bigger Trucks, a group which receives much of its funding from rail industry sources opposed to seeing the competitiveness of truck transportation improved versus rail. The second block are a number of public safety groups, such as the Public Citizen organization as well as others, that oppose changes to the law for safety or other reasons. Of late, Runyan says, these groups have been sending information to Congress that contain serious errors. 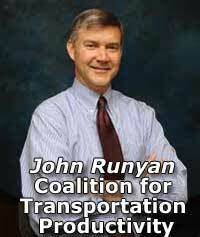 The letter to Congress from Runyan said that he wanted to "respond to the extremely misleading and factually inaccurate letter you received recently from a coalition opposed to the Safe and Efficient Transportation Act." For example, Runyan says that communication claimed that in 2009, 4000 individuals died in the US as a result of accidents involving heavy trucks, when in fact the total was about 15% less, at 3380. More importantly, the letter says, "While still far too high, that figure represents a record low since federal record-keeping began. More important, however, the number of trucks involved in fatal crashes has declined by 24% in the past 20 years, while the number of trucks on the road has grown nearly 47% during this same time period." In another example, Runyan says the opposition groups have been saying the heavier trucks would have a 25% increase in the length it takes to stop the vehicle, which is only true if the trucks are not equipped with a new sixth axlel. With that sixth axle, which is required under the plan the Coalition proposes, the stopping distances are actual about equivalent, Runyan says, citing a study by the Transportation Research Board. "All of our information is heavily footnoted, with the actual citations to back our claims," Runyan told SCDigest. "The opposition provides no footnotes and rarely cites the sources of their numbers." Other errors or distortions the Coalition alleges in the letter include claims the SETA change would result in more trucks on the road, would lead to greater total fuel consumption by trucks, would increase the level of wear and tear on roads and bridges, and claims that public opinion is strongly against the change. "simply defies logic," Runyan says. While the heavier trucks would get modestly poorer fuel mileage per truck, that loss would be far outweighed by the reduction in the total truck miles driven under the change, he says. Even though there is now proposed legislation in both the House and Senate, the Coalition's strategy has been to get the SETA law passed not independently but as part of an overall Highway bill. That legislation has been very slow to come, with no action taken in the last Congressional session, and the process somewhat set back with the change in control in the House to Republicans after the November elections. That led to a new chairman of the House Transportation & Infrastructure Committee in John Mica of Forida. While that delayed the process for awhile, Runyan told SCDigest that it is likely to increase the odds of a new Highway bill's passage, since Mica is favoring a much lower total spending package based on dollars already in the Highway Trust Fund, not adding significant new spending. While that angers some looking for big increases in the highway dollars to create jobs and/or address infrastructure deficiencies, in the current climate focused on the deficit, it may lead to faster passage of a bill. Runyan said earlier hopes for a new Highway bill being drafted sometime in July are not likely to be realized, but that a new bill should be introduced to committee sometime before the end of September. He says there are now 50 co-sponsors of the House SETA bill, representing a strong mix of both Republicans and Democrats. "That is a very positive sign that we will see this legislation included as part of a larger Highway bill," Runyan says. Are you in favor of the SETA legislation? Why or why not? Let us know your thoughts at the Feedback button below. So much of John Runyan`s argument is wrong. So very much. Who is to say that with heavier trucks the roads will not fill up with 97,000 pound commercial vehicles gleefully taking freight from the rails. Is the industry prepared to guarantee there will not be an increase in truck traffic if this passes? You get a 23% jump in capacity.... will you hold the line on vehicles. I thought not. Recently a physics professor helped me understand the force behind a heavy truck at highway speed hitting a stationary car. An event that takes place with alarming frequency in this country. If an 80,000 pound vehicle hits a stationary object at 65mph (the top speed controlled by on-board speed limiters as petitioned by the ATA and others) the force is the equivalent of 14 sticks of dynamite. If a 100,000 pound truck hits the same stationary car at 75 mph the force is that of 24 sticks of dynamite. Pretty dramatic wouldn`t you say. In reality, the speed the truck travels is more a factor in the calamity than the weight. Many supporters of heavier trucks point out that the EU allows trucks of roughly 100,000 pounds on their roads with reduced fatalities. They conveniently leave out that the speed limiters are set at 56 mph (90kmp) and the force of a crash is greatly reduced. Get it right John! Don`t argue that the railroads are supporting 80,000 pound trucks when you are a trucking logistics professional yourself. Anyone with a dollar in the argument should stay mute.